Whenever a service rises to popularity, an “open” alternative is usually close behind. The problem is that most of these alternatives never go anywhere, let along get close to the service they’re trying to supplant. But the rate at which Diaspora*, the open project hoping to be the new Facebook, is gaining funding is getting too big to ignore. The New York Times profiled the NY-based project yesterday, noting that the team of four NYU students gave themselves 39 days to raise $10,000 through the online fundrasing site, Kickstarter. As NYT notes, they shot past that goal in a mere 12 days. As of yesterday afternoon, they were at $23,676 in funding. Today, just one day later, that total stands at an amazing $58,315. And they still have 20 days of fundraising to go. 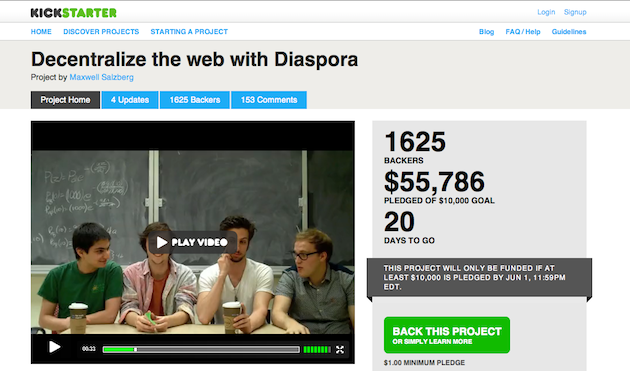 Anytime anything doubles in one day, it’s impressive, but even more impressive about Diaspora’s fundraising is that it’s all being done through micro-funding on Kickstarter. So far, some 1,625 people have donated the $58,000. The minimum pledge is $1, but so far, the most amount of people have pledged $25 (638 pledges), with $5 coming in second place (334 pledges). Over 100 people have given over $50, and 5 people have even given over $1,000 (with 2 of those giving over $2,000). And they’re drawing some big names to the fundraising drive. VC Fred Wilson just donated an undisclosed amount. And yesterday, TWiT’s Leo Laporte donated as well. The movement is gaining steam quickly. In fact, in just the time I’ve taken to write this post, the funding has surged another $3,000. Whether Diaspora succeeds or not, of course, is an entirely different story. The coding for the project (which aims to have everyone control their own social network on their own machines, though there will be a WordPress.com-like solution as well) won’t begin until this summer. But with controversy around Facebook at a fever pitch, these kids sure picked the right time to start the project. Again, they have 20 more days of fund raising to go. $100,000 seems a lock (probably even in the next few days), and don’t be shocked if they get a lot more through this micro-funding when all is said and done. And if they need more than that — I’m sure investors like Fred Wilson will be happy to talk. Update: As of this morning (5/13), the project how now passed $100,000 in funding with over 2,500 backers. That makes it the largest project to date on Kickstarter — and there are still 19 days to go.